Australia’s recent hike to the rate of departure tax could reduce the number of Australian tourists coming to New Zealand, and the New Zealand tourism industry is calling for political assistance on the issue. 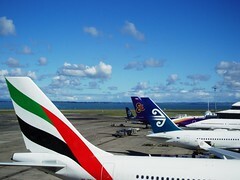 On May 1th the Tourism Industry Association New Zealand (TIA) called on Prime Minister John Key voice his concerns to the Prime Minister of Australia Julian Gillard regarding the recent increase to Australia’s high level of departure tax and its potential negative effect on the number of Australian tourist coming to New Zealand. Last week the Australian government announced that from July 1st the departure tax charged on anyone leaving Australia would be raised from AUD 60 per person to AUD 55 per person, equivalent to a 17 percent hike. The TIA is concerned that the increase will have a significant negative impact on the number of Australians who travel to New Zealand. The spokeswoman for John Key said that the Prime Minister would raise the TIA’s concern in Australia “shortly”, but gave no specific date. During the 12 months ended March 2012 approximately 1.17 million Australians traveled to New Zealand for short-term holidays, and, according to the Ministry of Economic Development, each visitor spent nearly NZD 1 500 when visiting our country.